Ever since I read Vinni’s post on last year’s Ride of Faith, I have been waiting for this year’s ride. The day I came to know about the Bison’s schedule, I started preparing, until I realized I don’t have leaves. Few days left to the ride, multi-reminders received and I was like, will I be able to make it? Something happened, meetings deferred, jobs got completed and I was able to ask my boss for leaves; and, who can deny you leaves that too for a Ride of Faith, Ride to AshtaVinayaka! I felt blessed that day, and now after the hard ride we had, I know I’m blessed! We are a nation of faith, which plays an immensely large role in our lives, being homely, officially or on the tar. Though Bisons have started riding hard the day they first met at BKC on a fine Sunday evening of July 23, 2011 at BKC; official announcement was made on the auspicious day of Ganesh Chautrthi, Shukla Paksha, Bhadra maas, i.e. September 1, 2011. What a wonderful ride then the Bisons had on an ancient pilgrimage route in the state of Maharashtra, popularly known as AshtaVinayaka! 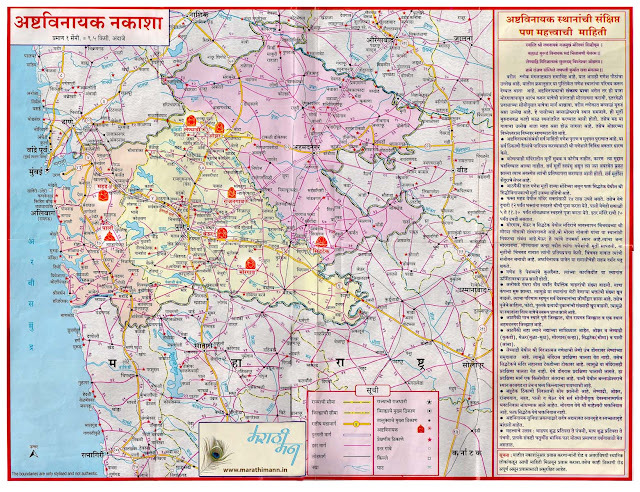 AshtaVinayaka includes eight-Vinayaka or Ganapati’s temple spread across 3 districts viz. 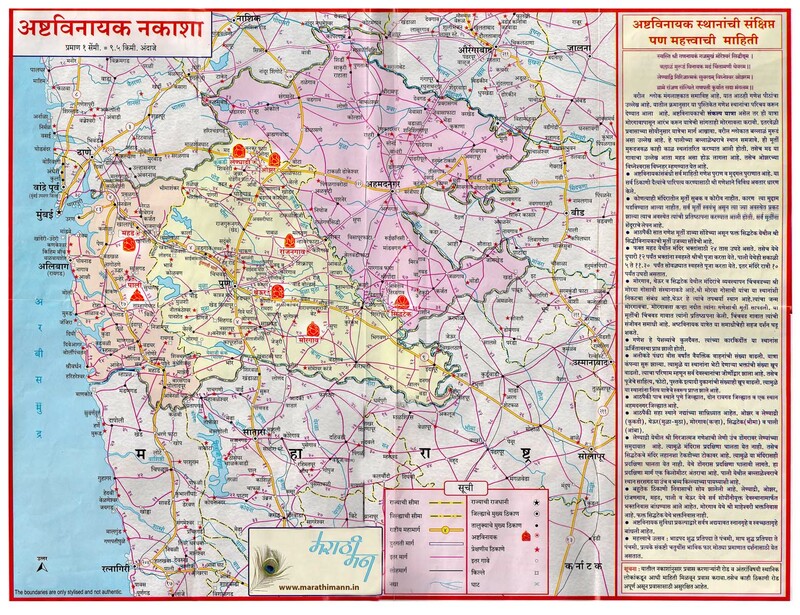 Ahmednagar, Raigad and Pune. Religiously one has to complete the yatra visiting the temples in a particular sequence, from Mayureshwar at Morgaon, and finally back to it. 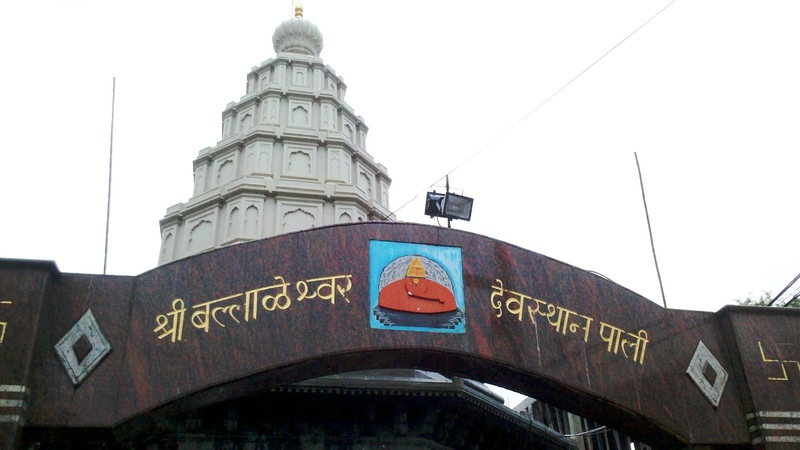 General Paa ji and the ride Captain Mohanty organized the ride so as to start the yatra from Aamchi Mumbai’s Siddhivinayaka, visit all the eight temples of the AshtaVinayaka along with one more en route, making it the DashaVinayaka Yatra 2011. As scheduled everyone assembled near the Sidhivinayaka Temple by 5:30 AM on September 3, except Vinni who proposed a plan to punish the late-comers the very last night. There were total 18 bisons on 16 bullets geared up for this auspicious but hard ride. It was a pretty Saturday morning with little rain, when we got queued for the darshanam. Minutes spent and the God of rain changed his mood. Then and there we knew a tough ride is waiting for the Bisons! Sidhivinayaka darshana was one of the best I ever had, was able to spend some minutes in the sanctum-sanctorum and feel the vibes of sanctity and positivity. By 8:00 AM, we were all ready honking the Bisonian tune, ready to raid the road towards Pali, thorough Panvel-NH 17. Our very own Kaka came to wish us a happy and healthy journey ahead at Vashi. Hard rain, in fact hitting rain, welcomed us on Palm Beach road and then accompanied throughout the day. 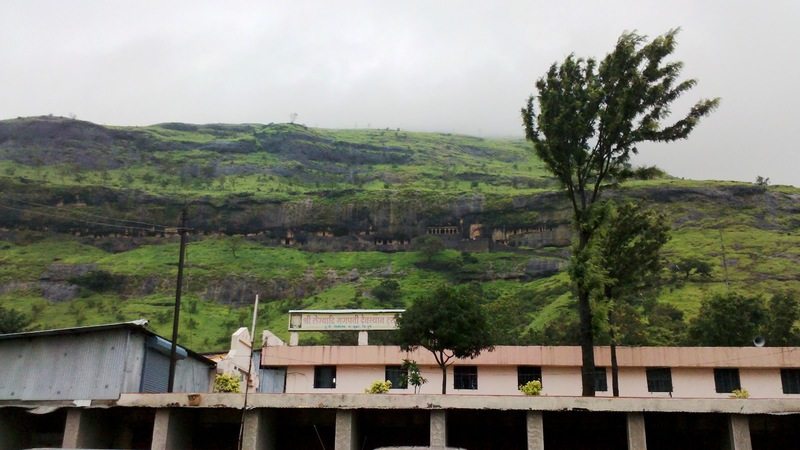 Pali is situated in Raigadh District, off NH 17 at some 74 kilometers from Panvel. Riding ahead of time, coordinating more-or-less as directed by General, most of the Bisons reached Pali by 11:00 AM. 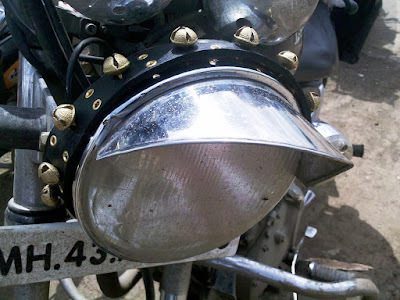 Later we got to know Indro’s bullet had got some problem and it registered as the first breakdown on the Yatra 2011. As Deelux confirmed on FB, ‘15 kms before pali, first breakdown. One bike just does not start. Love the bullet.’ While the rest of guys reached Pali, Yeda Anna and Tushar held the torch to demolish as many Vada Pav as the vendor can fry leading the rest of the bhukkad Bisons! 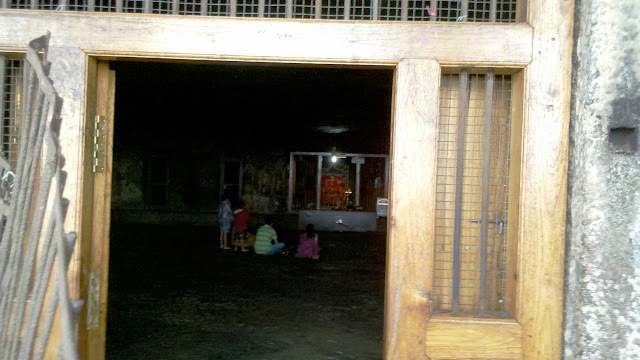 At Pali, we had darshanam of Shri Ballaleshwar Ganapati and Shri Dhundi Vinayak. Next stop was Mahad on NH-4, some 41 kilometers from Pali in Raigad district only. We started at about 2:30 PM and riding through one of the most awesome region over a really awful road, connecting NH-17 to NH-4. Thanks to the first vibration-mode ride of the trip, we couldn’t savor the untouched virgin beauty sprawled across. En route my Achtung went blind, may be due to water that would have entered through the cracked headlight-glass (theorized by Sameer, and accepted logically). Shri Varad Vinayaka is the Ganapati of Mahad Shri Kshetra. Shri Kshetra or His Region is term used to define the region where He sits, in this case, where there’s an establishment of one of Shri AshtaVinayaka. Ahead was a cool and easy ride through heavy rains on NH-4 towards the day’s halt, Ozar. Riding on our Bullets, we took little over 3 hours to cover some 145 kilometers from Mahad to Ozar. Achtung went blind again and I had to ride last tens of kms following Joshil’s HID lamppost headlights! Most of us were completely drenched from head to toe, including those who wore raincoats. In fact water percolated through the waterproof bags. At Ozar, Shri Vighnahar Ganapati is being worshipped. 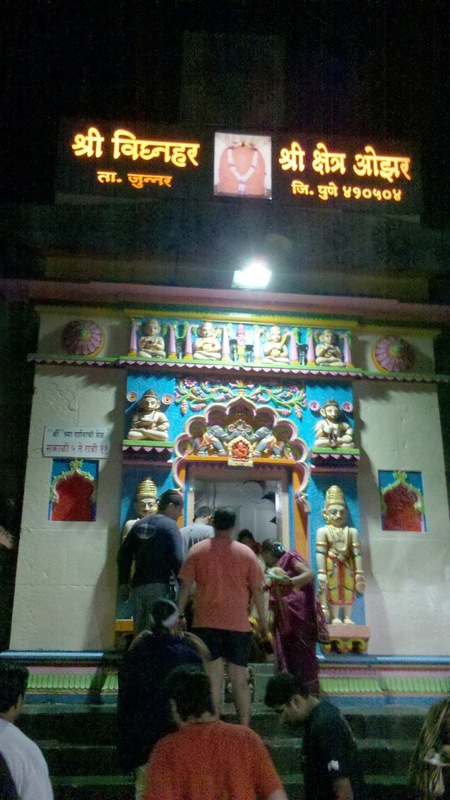 We checked in to BhaktaNiwas, refreshed and visited the temple at around 9:00 PM. General Guri pa ji had already ordered a luxurious vegetarian dinner for the troupe, which tasted hell better than a multi-course fine dine, thanks to the Vibration-mode ride we had on bumpy roads! Next morning, Captain Mohanty was happy for the successful first day ride irrespective of a small breakdown, heavy downpour and bumpy roads. That morning I came to know more about Sameer, the man who had been to the rider’s heaven, the Leh-Laddakh, thrice, that too solo! The best things with ride, apart from the ride, tar, individuality, is that it provides you to know another rider, that may inspire you for the very next step, you have ever been hesitant to make. Morning chae, Parley biscuits and we were ready to ride ahead towards Lenadri at the scheduled time 8:00AM. Lenadri or Lenyadri is about 15 kilometers from Ozar, connected through a bumpy state highway. We took some 30 minutes to reach Lenadri caves, where in one of the Buddhist era caves, Shri Girijaatmaja Vinayaka is worshipped. Mohanty and I went last to the temple, and on his curiosity counted the stairs at about 280 from the ticket counter till the Caves. The caves have been dated back to 3rd Century BC and fall under Archaeological Survey of India’s jurisdiction. Bisons had their breakfast there and also bought the jugaad-raincoats there for ride ahead to Ranjhangaon. Sameer, Tushar, Afraaz and Indro left for Mumbai somewhere near Narayangaon, and the rest 13 Bisons on 11 Bulls moved ahead. 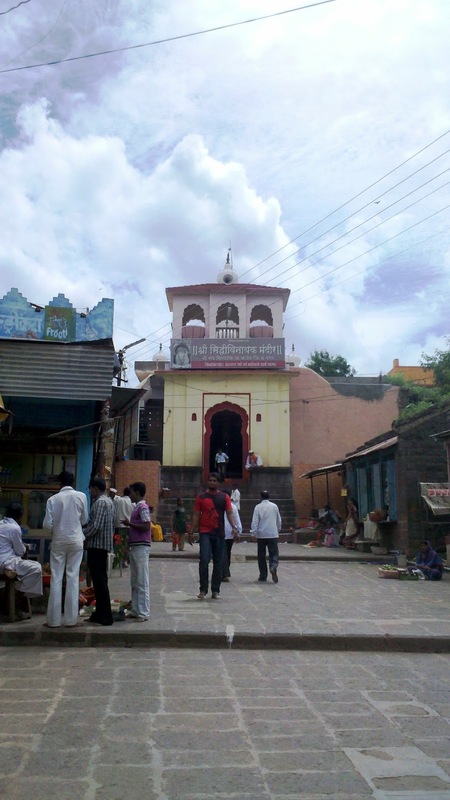 Ranjhangaon, located in Pune at about 90 km from Lenadri, is home to Shri MahaGanapati. En route, though we had a sunny day, another bullet started showing some trouble. Somehow, we reached Ranjhangaon at around 3 o’clock afternoon and had darshanam of Shri Mahaganapati through paid VIP line to compensate the delays to some extent. We soon started from Ranjhangaon, but not towards the next temple but Hadapsar to get fixed the troubled bullet and also minor problems with the other ones. Few hours there, and we could only reach Theur by 10:00 PM. 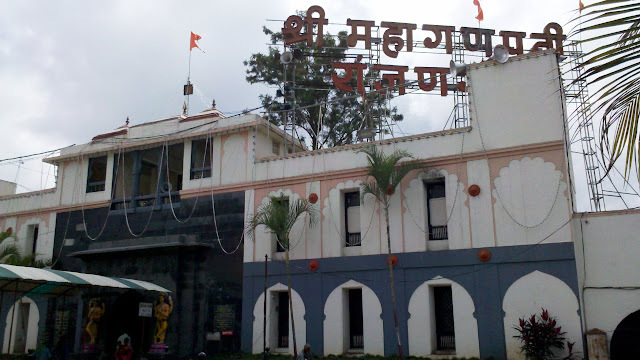 Theur is adobe to Shri Chintamani Vinayaka, in Pune district, some 50 km from Ranjhangaon. We had the divine darshanam in night only. Shri Chintamani Vinayaka idol was the cutest idol we visited. Again General arranged an awesome dinner with plenty of Thecha, Marathi chutney of meshed green chilies and garlic. And after that, Archana sang for us an old song in her pretty voice. Through the day we had troubled bullets, intermittent rains, hell lot of potholes and a missed destination. Though we didn’t talk much, but I know most of us wished the day ahead being sunny and blessed with success too! That was one of the best Monday mornings I ever had, when I didn’t prepare for office but saddled up for the ride ahead. On schedule were two-temples and some 490 km of ride. Our first destination was Morgaon, at about 65 km from Theur. We started early, riding high on wet-and-shiny NH 9. We would have done some 40 or so kilometers when Joshil’s bullet started troubling again and Deepak bhai’s Bullet’s floating bush worn out. Few of us get into mech-search for Joshil, while General and the team packed and dispatched Deepak’s bull back to Mumbai. Just two temples left and Deepak had to call off from the ride. He wished be invited by Bappa next year, for a complete successful ride! Riding late on time, we reached Shri Moreshwar Temple, Morgaon at 11:45AM. 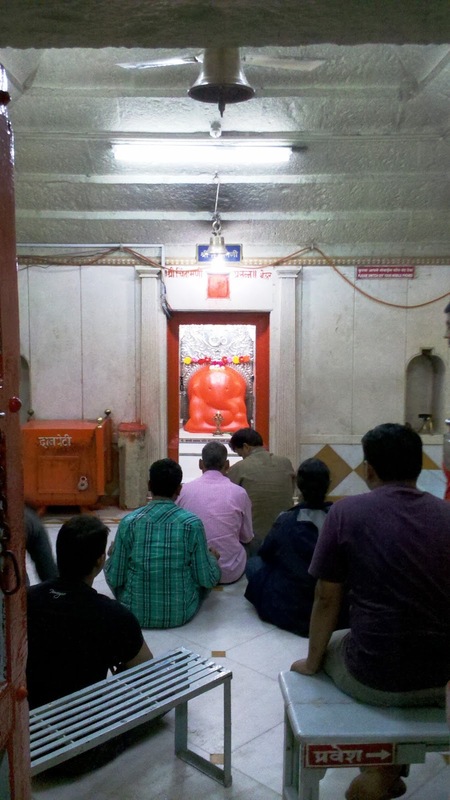 AshtaVinayak yatra is customarily commenced at Shri Moreshwar Temple only. A sigh of relief we had, after completing 9-Vinayaka temples, the one left was Shri Siddhivinaya at Siddhatek. 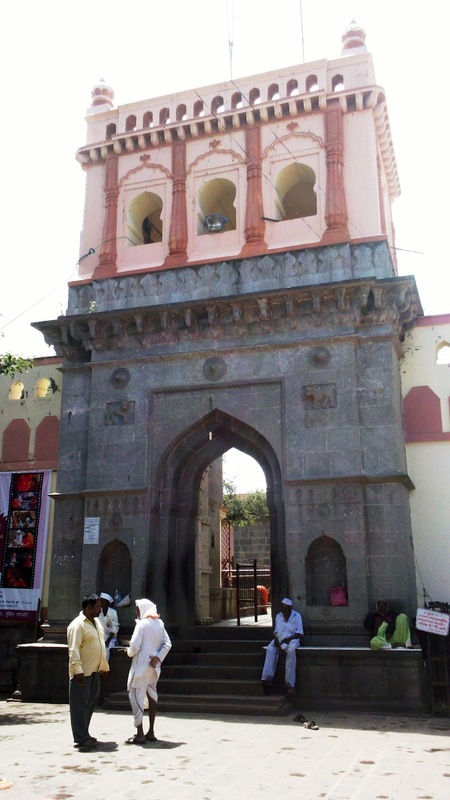 Siddhatek is located in Ahmednagar district at about 70 kms from Morgaon. 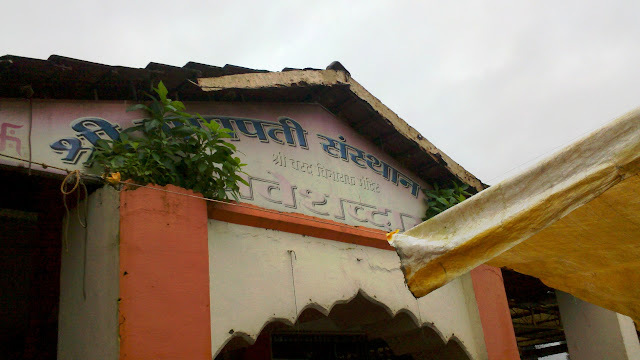 A ride through NH-9, and off roading on bumpy road took us to Shri Siddhivinayak, Siddhatek at around 2:00 PM. Divinity in the final darshanam was evident within our souls. It feels so celestial on completing a route successfully, irrespective of your inclination towards Him, the Almighty! अर्ज़ किया है, Bums का निकल गया है दमस् ! A break there, some much needed rest and food, we were again on Bullets, honking, talking but following each other in close knit gang till we reached the PalmBeach Highway. When waist-stretch and suttas were done, rain welcomed us again! It was heavenly feeling of achievement and being blessed to complete such an extra-ordinary feat! We drenched completely many a times, being bumped on the poor roads to limits of hell, major breakdowns, but what we had as last wish, Bappa do invite us next year too….. I have done the Ashthavinayak circuit twice and its awesome... My favorites are Lenyadri and Ojhar!! The sugarcane juice and the fresh Poha is mouth watering! Have a fabulous sunday Punit. You should come again this year!